Former President Bill Clinton and the surviving members of the Little Rock Nine came together Monday, at Little Rock Central High School, to commemorate the 60th anniversary of the school’s integration. 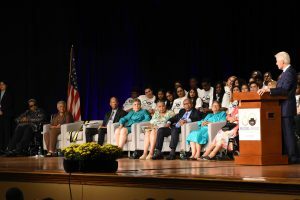 The ceremony marked the culmination of the four-day celebration, which included a series of speaking panels, a statue dedication, a benefit concert, and an interfaith service; all in honor of Central High’s integration. The events, collectively called “Reflections of Progress,” were organized by the city of Little Rock, the Little Rock School District, the U.S. Parks Service and several other contributors, according to a press release from the event’s planners. Also speaking at the commemoration were Henry Louis Gates Jr., Ark. Gov. Asa Hutchinson, Little Rock Mayor Mark Stodola, Regional Director of the National Parks Service Cameron Sholly, and former Central High Student Body Presidents Joy Secuban and Darrin Williams Sr. The commemoration’s host was Sybil Jordan Hampton, a 1962 Central High graduate, educator, and former president of the Winthrop Rockefeller Foundation. Central High’s Principal, Nancy Rousseau, introduced President Clinton. The mood of the ceremony was hopeful determination, as many of of the speakers –including President Clinton and several of the Little Rock Nine– praised our nation’s progress since the civil rights movement, but warned their audience that the struggle was far from over. Henry Louis Gates Jr., award-winning author and filmmaker, spoke about the responsibility of “those of us who love truth and justice” to ensure that America doesn’t return to the racial injustice of its past. Ernest Green, the first African American to graduate from Central High, spoke about the nature of progress. The “local magazine” Green referred to was the Arkansas Times’ April 21 issue, whose cover story was a report on current resegregation of Little Rock schools. Carlotta Walls LeNier, the youngest member of the Little Rock Nine, brought some humor to the event in her opening remarks. She recalled her request for the 60th anniversary when asked by Little Rock’s City Manager, Bruce Moore. “I would like to have dinner in the White House with President Hilary Clinton,” LaNier had told Moore. LaNier went on to recall the many reunions of the Little Rock Nine, reflecting on how far they had all come since 1957. She paid fond tribute to the absent ninth member of the Little Rock Nine, Jefferson Thomas, who died in 2010. “He was the one with the engaging sense of humor, and we miss him in these days,” LaNier said. LaNier spoke out against President Trump or, “number 45,” as she referred to him. She claimed that, due to the President’s recent actions, “we become as we were 60 years ago,” but ended on a note of encouragement. Minnijean Brown Trickey also spoke against the current President, accusing “number 40-whatever of suffering from #profoundintentionalignorance.” She went on to joke that since the event was televised, she expected a tweet from the President. Trickey went on to say that she hoped the event would inspire this generation of young people. She closed he speech quoting fellow Little Rock Nine member, Elizabeth Eckford. 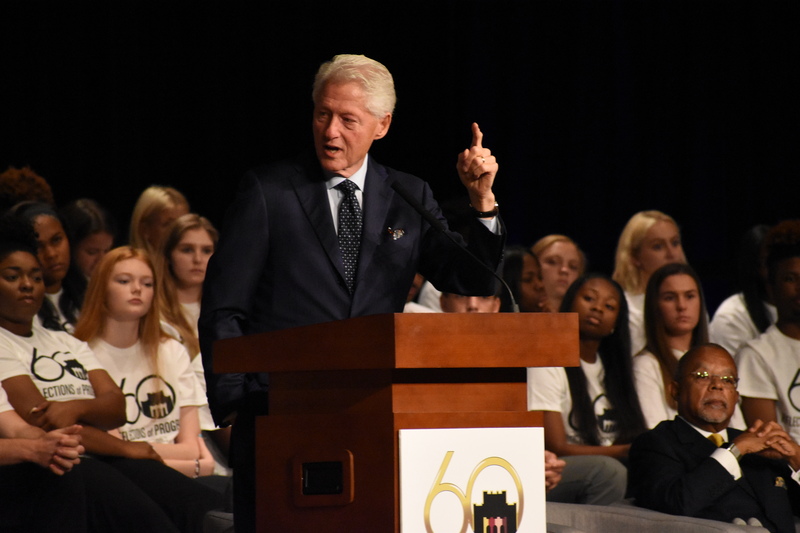 President Clinton finished the event, starting with lighthearted reflections and thanks to the the members of the Little Rock Nine and fellow speakers. Clinton went on to discuss the science behind race and genomics, emphasizing the point that we all came from the same place. Clinton reflected, as many of his other fellow speakers did, on the progress America has made since, but warning that the struggle for racial equality continues. He closed with a call to action to continue the progress made since the Civil Rights Movement. Leading up to Monday morning’s commemoration ceremony, organizers hosted five additional events. These programs look back 60 years to examine the integration of Little Rock Central High School, the events leading up to integration, and the lasting impact Central High has had on Little Rock, America and the world. The event series began Sept. 22, with the dedication of the “United” sculpture on the front lawn of Central High School. Members of the Little Rock Nine took part in the unveiling. The statue depicts two figures raising their arms to unite two interlocking rings. The rings are incomplete, signifying the progress that still needs to be made. Saturday morning, students and educators alike attended an education symposium at the Clinton Presidential Center. The discussions consisted of three panels, including civil rights leaders, members of the Little Rock Nine, and academics. Hon. Wiley Branton Jr., gave the opening speech, introduced by NAACP President, Dale Charles. The first panel discussed the Civil Rights Movement leading up to 1957, including the 1954 Brown v. Board of Education ruling. Panel two discussed the 1957 integration of Central High, as well as the “Lost Year” of 1958-1959, when Little Rock shut down its schools rather than continue to allow black children to integrate. The final panel looked at the impact had by Central High’s integration to present day. Later that evening, gospel singer and civil rights activist Mavis Staples preformed at a benefit concert, supporting the Little Rock Nine Foundation. Members of the Little Rock Nine were in attendance for the concert , which was hosted at the Robinson Center Performance Hall. On Sunday, Sept. 24, the children of the Little Rock Nine spoke at a panel in the Ron Robinson Theater. The event was hosted by the Clinton School of Public Service, the Butler Center for Arkansas Studies, and the City of Little Rock. 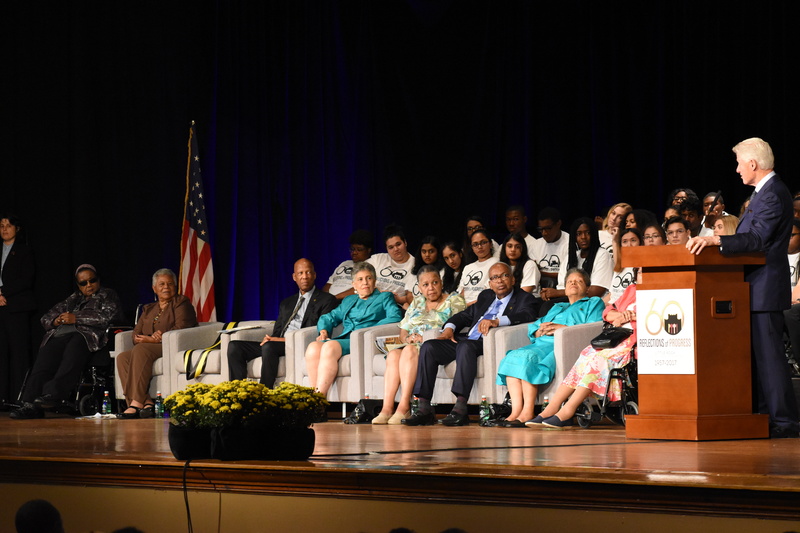 During the panel, the children of the Little Rock Nine discussed what it was like growing up with such prominent members of the Civil Rights Movement as parents. Later that evening, local and national faith leaders conducted an interfaith service at the Robinson Center Performance Hall. Members of the Little Rock Nine were in attendance, and the service included a performance by an interfaith community choir.